You might remember such blog posts as my thoughts on the King St. Pilot and my long thread on Twitter on the subject. Since the pilot has started, I have used the Transit app more and more to give me transit directions. It does things like notify me when I'm two stops away and when my stop is approaching, useful only when GPS is available (i.e. not underground in the TTC subway). In August, it introduced Go, a crowdsourced real-time vehicle location feature. Many transit agencies, the TTC included, give the public access to real-time location of buses and streetcars, but the Transit app developers claim it can be 30 seconds out of date. 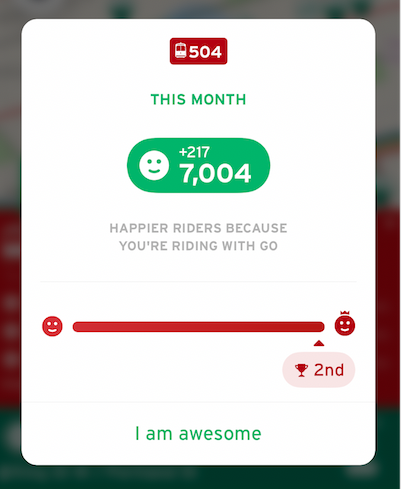 With this new feature, riders are the source of information, and it feeds back to Transit's servers. I imagine the person who came in first tracked their trips for every rush hour during weekdays, whereas I worked from an undisclosed location couple of days in November and forgot to press "GO" a few times I did commute to the office along King St. Some interesting problems came up: I sometimes take the 503, but it's not always listed as an option in the Transit app. It's truly the Secret Streetcar! I counted it as 504 for the purpose of the game. It did sometimes ask me if I was on the 503 or the 504, and I told the truth each time. Midway through using Transit Go, the 504 changed how it was split. Long story short, instead of two routes, 504 and 514, it changed where they turned off and kept 504A and 504B as the route numbers. The Transit app doesn't seem to differentiate between the two. That works out fine for me, since I'm aware of the difference, and even once a 504B caught up with a 504A (which I wanted to be on eventually), so I hopped off the streetcar that would turn left at Dufferin and got on the streetcar that would take me to Roncesvalles. I don't know what happens if I end up 1st since I haven't ended up as 1st on any of the routes I take over the course of a month. There doesn't appear to be an API that I can tap into (to get where I went, how many people I helped, which place I'm currently in for a route). There are real-time updates to the directions (e.g. when I might miss a connection), but I haven't tested updated instructions for times when I stop at a transfer point to do something, like go to a coffee shop. It's still neat to try to get to the top and to wonder who it is that's more eager to give their location data away for free than I am, though.